As previously posted here, the new SIGCHI EC wanted to identify the strategic initiatives to be the focus of our work for the next three years. We began this process by distributing a call in early July 2018 to the SIGCHI community to provide Grand Challenges for the new SIGCHI EC to address. 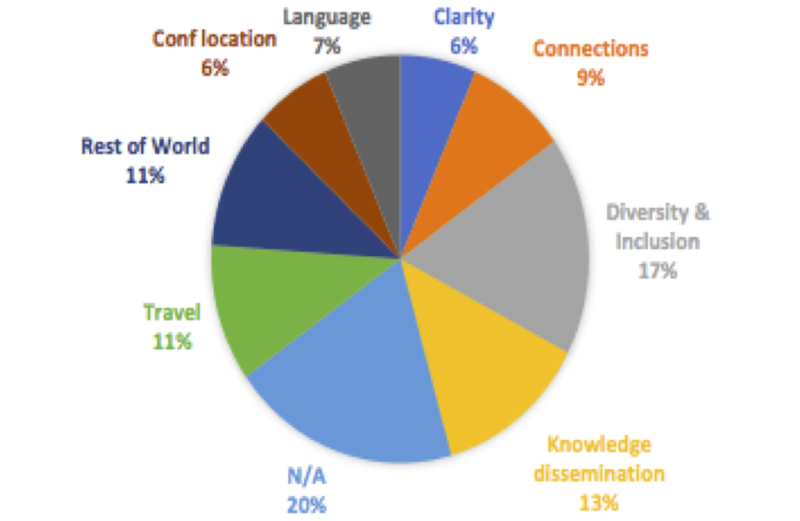 There were 38 respondents who came from 16 different countries and provided 46 grand challenges in total. The following are descriptions of these categories and some of the outcomes of these Grand Challenges. The following two categories of issues are at the core of any professional organization. It was good to see there were not many of these concerns brought to light, but of course we can always do better. Clarity: This included issues with confusion over chapters naming, properly documenting the history of SIGCHI, and providing guidance on how to volunteer. Connections: This included questions on how to identify opportunities for people to have academic internships, provide support for more networking, and reach out to other HCI communities. The SIGCHI EC has been actively working on sharing more and more information, trying to clarify processes, and make transparent the mechanisms for volunteers. We have articulated openness as one of our Values. The VP of Chapters along with the ACM will work on clarifying the chapter naming rules. And the VP of Communications and Membership has been working on a mentor/networking initiative that will most likely roll out in the next year. The following three categories were the most frequently cited issues and opportunities, both individually and as a collective whole. Diversity & Inclusion: This was a large concern covering many issues such as accessibility, further support for diversity and inclusion events and outreach, including more regional weigh-in into the EC’s decision making, and having venues for other types of authors (i.e. not just researchers). Knowledge dissemination: A core aspect of SIGCHI, there were a number of requests to do more in this area, such as to collect and bring together the myriad of HCI videos, to provide more online courses, to consider having our conference papers be published in journals, to provide accreditation/certification, to address the ACM Future of Computing’s statement on negative broader impacts, and to devise an HCI curriculum. Travel support: There were requests for more travel support for those from developing countries, more travel support for students, travel support for academics from a variety of disciplines, and a request for travel support specifically for undergrads. The SIGCHI EC has appointed an Adjunct Chair for Inclusion who will be forming a committee to address diversity and inclusion very broadly across all of our activities. Knowledge Dissemination is a core function of SIGCHI and we are now seriously talking about ways that we can provide further infrastructure and incentives to support the ideas listed. Travel support is always a large request and the SIGCHI EC will take into account these requests for further avenues of support in our next budget period. The following three categories are all related to the rapidly growing global reach of HCI. Other issues and opportunities above were also related to global HCI such as, for instance, travel support and an HCI curriculum. However, the following were specific issues that are unique to this global spread. 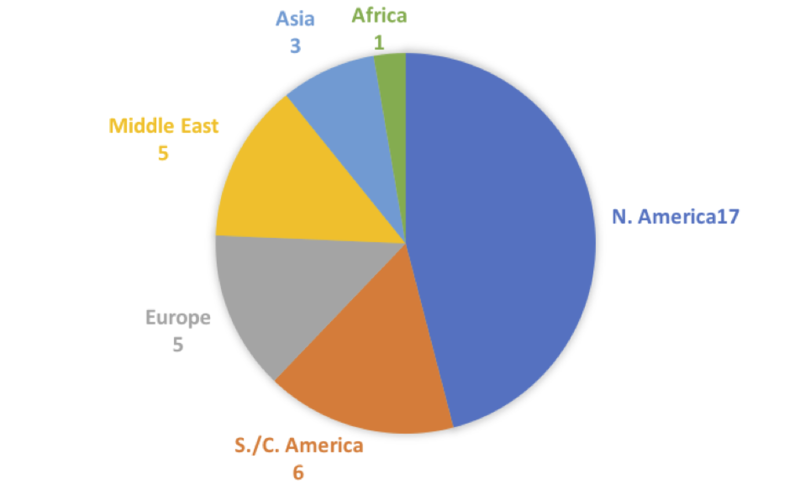 Global reach: There were a few specific calls for us to address the HCI community needs of MENA, China, and Latin America. Conference Location: Related to above, it was posed to us a few times to consider hosting conferences in Africa, “developing countries”, and “centric regions”. Language: There was a request for more translation of our materials, allowing for oral presentations, and support for non-native authorship. These suggestions parallel the ongoing efforts of the EC, especially in work on SIGCHI Across Borders as well as the effort we put into distributing our 24 conferences around the world. We’ve been excited by the energy and enthusiasm in SIGCHI members who have been organizing in new regions and look forward to new opportunities in those places. This has now become a Strategic Initiative for SIGCHI. Many of these issues have been translated into high level strategic initiatives for the SIGCHI EC to address in the next three years. Although we may not be able to address all of the individual concerns raised in this next three years, we hope to be able to touch each category of Grand Challenges raised by our community. We also appreciated the time our community took to tell us what they thought. We were especially excited to see every submitter also say they would be happy to volunteer to help with the issue they put forth. That was a surprising outcome, but a very pleasant one. The SIGCH EC may put out another call for ideas soon, but in the meantime if you have anything you want to share with the SIGCHI EC, you can contact us at SIGCHI-EC@acm.org.